Nathan Fillion´s Halloween Costume. . Wallpaper and background images in the Nathan Fillion club tagged: nathan fillion halloween 2012 twitter. This Nathan Fillion photo contains béret vert, forces spéciales, soldat d'élite, soldat d’élite, fatigues, fatigue, and tenue de combat. There might also be tenue militaire, régimentaires, regimentals, and gilet pare-balles. 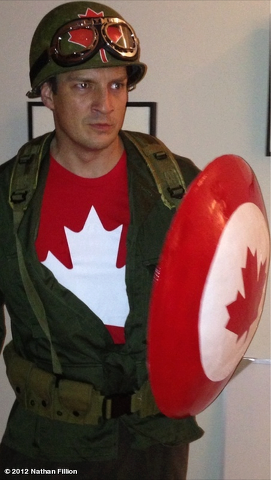 Lol, Captain Canada. You just got to love his sense of humor.